Just like trees, the best varieties of shrubs in container gardens are those that are slow growing and compact. Many shrubs come in dwarf varieties and have the work “nana” in their botanical names. Using shrubs in container gardens provides lots of options to home gardeners. They can be moved around from season to season – perhaps acting as a background for flowering plants in the summer and then taking the spotlight with fall color in the autumn. A row of shrubs in containers can create a wall or boundary. They can provide privacy or hide “eyesores” from the garden area – air conditioning units, garbage cans, etc. 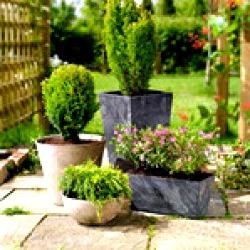 Group an evergreen with other containers of flowers or foliage, or group several of those evergreens together to create a corner or define a space. How you use them is entirely up to you. 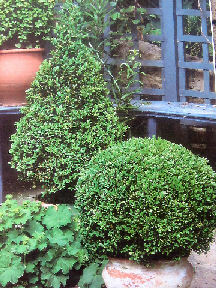 Shrubs come in several forms – conical and columnar, to rounded or arching. Choose the shape that best fits your placement of the container. Columnar or conical types may accent contemporary homes or apartments, and more traditional plants that round or arch may be better for a Victorian home. All of them are good for accents or barriers. 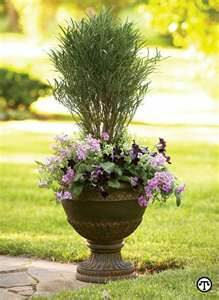 Shrubs in container gardens can be used as the focal point of the garden design. They may flower themselves, or they may act as an anchor plant for flowering or trailing perennials or annuals. 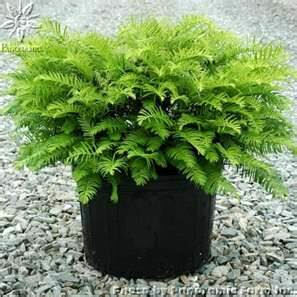 Healthy plants should be transplanted from nursery pots to containers that are a few inches wider and deeper. The best shrubs in container gardens are species that are slow-growing or naturally dwarfed. Plan to re-pot them every other year, allowing for a gradual increase in pot size to accommodate root growth. In most climates, the best time to plant is spring, although in mild-winter areas they can also be potted in fall or even midwinter to reach their peak in spring and summer. Most materials – concrete, plastic, stone, terracotta and wood – are all good planter options for shrubs in container gardens. If you live in a cold-winter climate, you should use containers that can withstand freezing temperatures, like high-quality wood or thick stone planters. You can also try fiberglass or polyethylene pots. They are lightweight so you may need to weight your pots with some gravel in the bottom if you live in a windy area. When planting, use a high-quality potting soil made specifically for container plants. For bushes, use a soil based potting mix – it is better than soil-free mixes because it is heavier and will help anchor a bigger plant and it’s root system. It also helps provide a sturdier base for the container in wind. Acid loving shrubs like camellias or rhododendrons will need special potting mixes with the right pH for their best growth and lovelier blooms. Most shrubs in container gardens grow well in sheltered locations that get good sun but little wind. For tall plants, like bamboo, locate against a wall of other sheltered area. 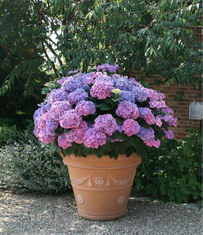 Flowering shrubs like this hydrangea (a great shade plant) do well in containers – just make sure the pot is big enough. To plant, follow these easy steps. Prevent the pot’s drainage hole from clogging by lining the inside base with porous filter fabric and a layer of pea gravel, 2-3 inches thick. Measure the distance from the nursery container’s base to the soil’s surface. Then fill the planter with soil until the remaining space equals the depth of the nursery container. Lay the bush on its side. Slowly roll it as you press and release the sides to loosen the root ball. Hold the trunk or stem at its base, then gently push on the container to free the plant. Carefully unwind or cut any encircling roots with a trowel or knife, then score the sides of the root ball. Grasp the root ball and settle the shrub into the new container. Fill around the roots with soil. Thoroughly water the container and allow it to drain. Add soil if any uneven settling occurs. Pruning doesn’t just shape the plant – it also helps limit the growth of roots which is important in container plants. Keep your plants looking well-tended. Shape by trimming away long branches. Use a slanted cut just above a node. A node is a spot where leaves attach to the branch. Snip just above that and a new sprout will soon grow. Prune away any dead or dying stems or branches. Trim off any branches that are out of line – the ones that hurt the overall shape of the shrub. You want only the strongest and straightest branches to grow. Cutting off bad growth lets the plant use its energy to grow better branches. Here are some of the recommendations from experts for varieties to plant in containers. You can also search for shrubs at garden.org. 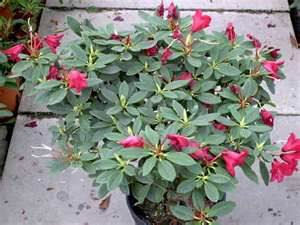 Enter your hardiness zone, select plant type “shrub” and then special feature “containers”. You will get a list of recommendations for your area. To the left is hydrangea. Right center is a rose and below that is boxwood. Roses in container gardens warrant more discussion. 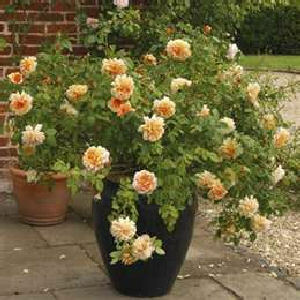 Please visit my page about Growing Roses in Containers. To find other recommendations for shrubs in container gardens visit The National Gardening Association’s website. You can select your growing region, plant type “shrub”, special feature “containers” and any other parameters you wish to use. You’ll get your own personalized recommendations. It’s a great resource. If you are interested in shrubs that are drought resistant, visit this site’s Drought Resistant Plants.